The internet constant hyperlinking and mode-switching is exhausting, and disruptive to concentration. As we struggle within the cognitive tug of war of our new media landscape, comics offer a useful model for a new type of reading: one that might help resolve the tensions of the current media age to move us toward new productive modes of expression and understanding. Seven years (*) after the Kindle debuted and more than twenty since the web went public, the publishing field still contemplates a transition from print to digital, a change that seems inevitable every time a baby swipes an iPad on Youtube. But anyone whose attention span has been radically rewired by the internet intuitively knows what scientific voices like Professor Maryanne Wolf are beginning to suggest: our brains process print media and digital media very differently when we read. Both modes have their strengths: digital media may favor executive multitasking and multimodal information processing, whereas print promotes "deep reading," contemplation and the synthesis of new ideas. * Aquilo do "2014" menos sete. So what are we supposed to do with this information? Do we accept the loss of deep reading in exchange for skills that can keep pace with our accelerating technology? Wolf offers a third way. "What we’re after is a discerning ‘bi-literate’ brain," she argues. [And] a thrilling model for "bi-literacy" already exists. And you can find it in comics. For more than a century, comics have demonstrated a form of communication that marries the linear sequence of typography with the global perception of an internet-like matrix of simultaneous parts. 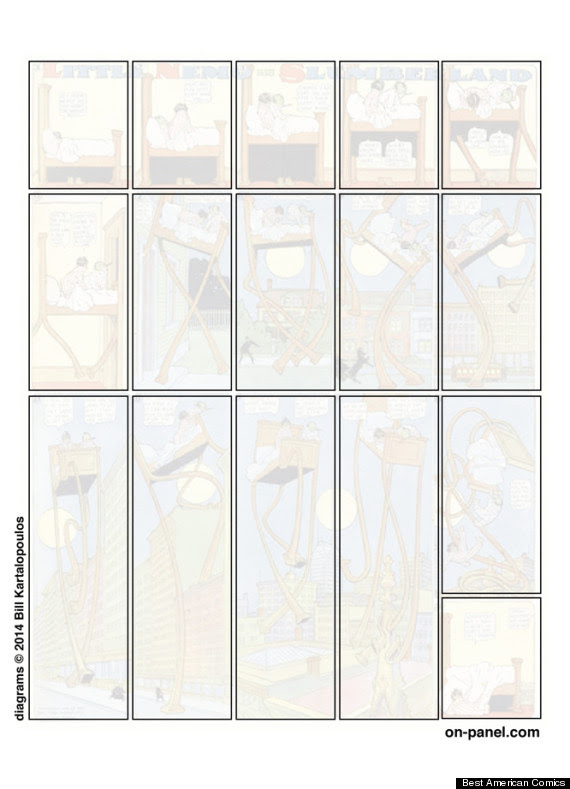 In the Little Nemo page above, the reader returns to a non-linear point of view after reading the initial narrative sequence in order to activate the reflection and synthesis we associate with deep reading — the thing that we fear we will lose in an online world. Great comics produce their essential meaning from the relationship between these two modes: both ways of looking and reading are needed to fully appreciate the work. While closely aligned with literary culture, comics are also a kind of visual art. Like any art form, comics has its own medium-specific properties that allow us to express ideas that can’t be expressed in any other way. But unlike our most traditional art forms — painting, drawing, sculpture, textiles — comics aren’t necessarily made of any one material. More like collage, comics represent a conceptual strategy that can embrace all kinds of artwork into its method. And while we do also read comics, comics induce ways of reading that are very different from prose. 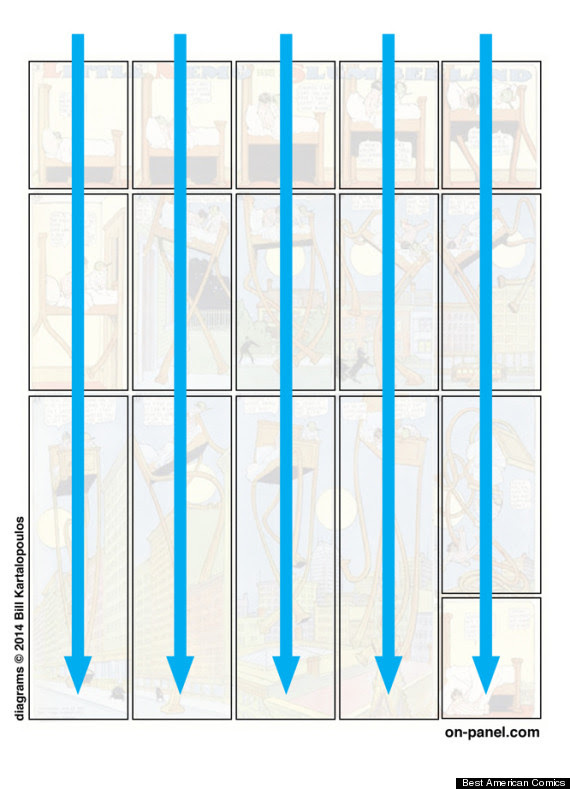 We get the narrative — the "story part" — of this comic strip by reading the panels in linear sequence. But if we knew nothing at all about the comic strip’s story, what might the overall structure of this page tell us about its message? 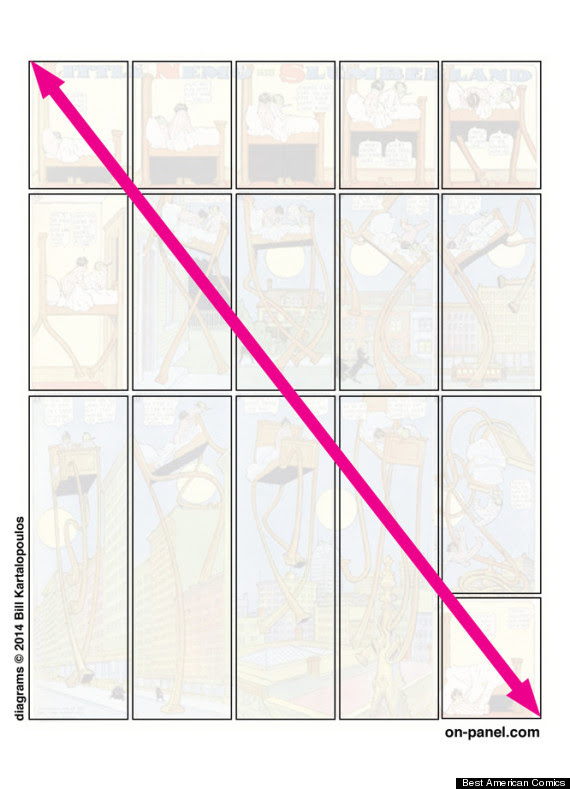 The particular syntax of comics has been most fully developed within the context of the single page format [and] we can extend that analysis to articulate something fundamental about comics that also relates to our current cognitive confusion. E da leitura dessa prancha leiam no original: qualquer coisa sobre chegar ao fim e voltar ao início, hint hint. 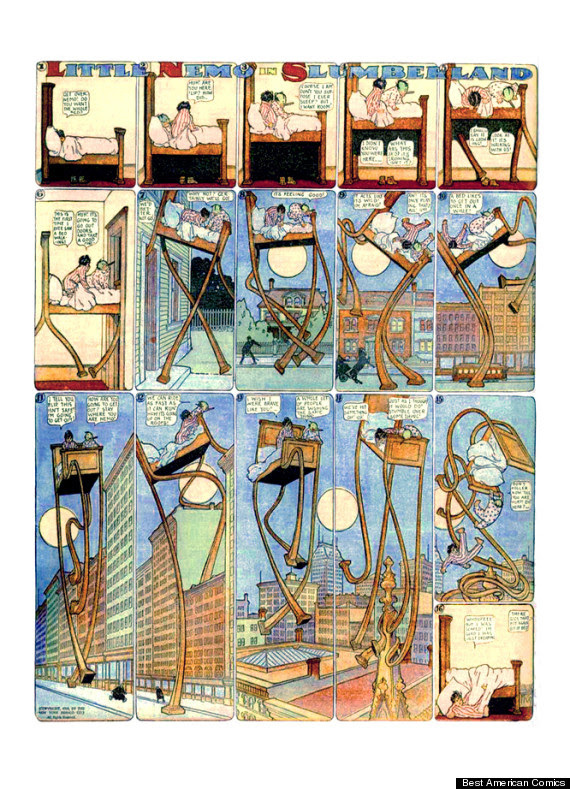 It’s not hard to imagine the story of Little Nemo’s galloping bed adapted into full blazing CGI but what would be lost in this translation from one form to another would be the poetics of comics: the aesthetic experience of simultaneously experiencing a comic’s form and content so harmoniously that the contours of the comic’s theme can be read in its architectural blueprint. 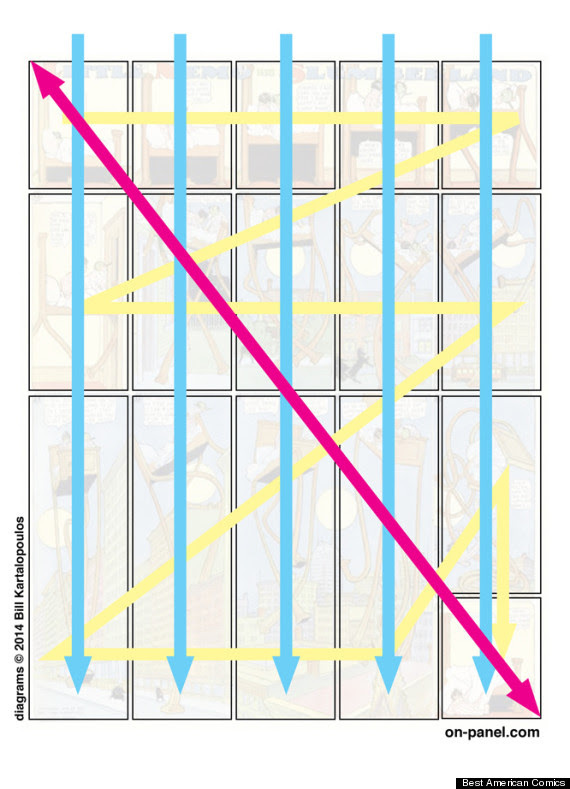 Artful comics induce a kind of double vision in the reader: we fully experience the work by understanding the relationship between the parts and the whole; between linear sequence and the simultaneous perception of related fragments. This is the medium-specific quality that brings us back to the internet and our endangered "deep reading" brains. 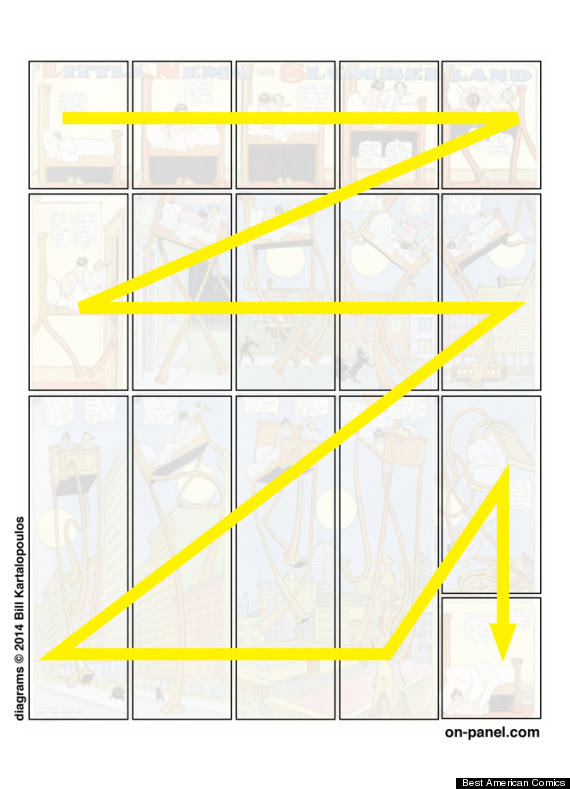 Portanto, repetindo, "if we knew nothing at all about the comic strip’s story, what might the overall structure of this page tell us about its message?" 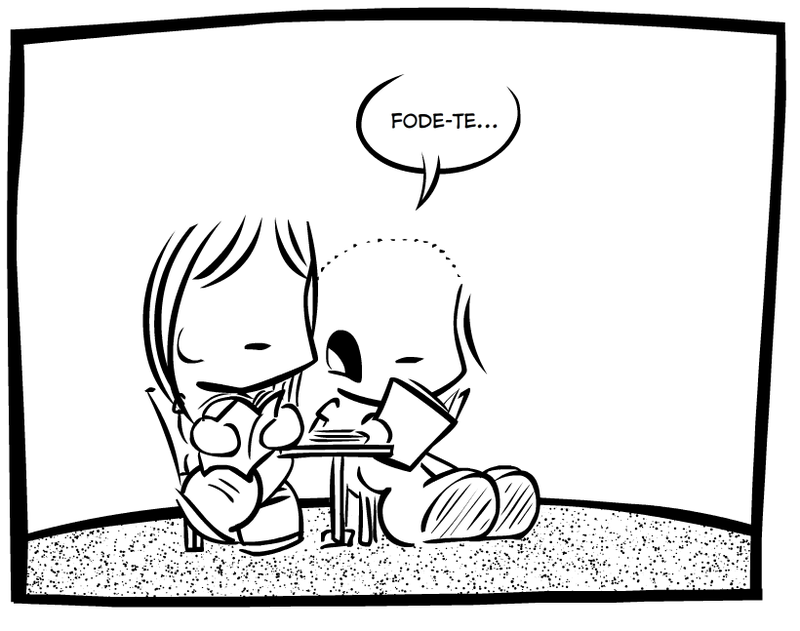 OS POSITIVOS: para os teus maus hábitos de leitura.